At first glance, the image is a provocative one. A road curves across a barren landscape, snow-capped mountains in the distance. The guard rails appear sturdy and unbroken, the pavement new and uncracked; a signpost assures the traveler that a destination lies ahead. 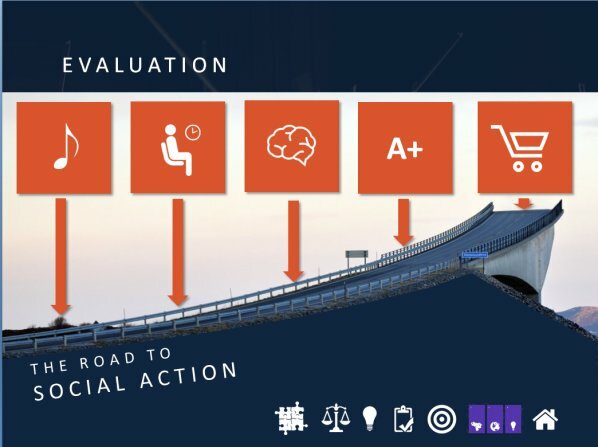 The road climbs to its apex on a bridge: there is the promise of a spectacular vista at the zenith of the span, but whatever potential reward that awaits is paired with equal or even greater risk. From the perspective of the traveler still climbing, all that can be seen is a precipitous, terminal drop. I used this image in Salzburg as a metaphor for Sistema and the current state of program evaluation. Much like the new definition (see previous entry) for the activities in Venezuela, this was an effort to place feet firmly on the ground in an effort to clarify the road ahead. In the slide I demarcated the few waypoints we can identify with certainty. First and foremost, a program of social action through music should produce strong musical outcomes, hence the leftmost orange box. The controlled learning environments and habitual emphasis on discipline in the typical classroom both serve to cultivate better self-regulation and self control skills in program participants (orange box No. 2). Then finally, there are also well established benefits in the realms of cognitive development and academic outcomes. None of this is or should be controversial. Then there’s the final orange box, which displays a shopping cart. I might have replace the cart with a kitchen sink, because this was intended to symbolize everything else: the reduced crime and recidivism, the improved social cohesion, the diminished drop-out rate, the poverty alleviation – all the things Sistema wants or envisions but doesn’t yet have a mechanism to measure and therefore prove. And thus the shopping cart remains perched on the precipice with its fate as yet unknown, the road apparently disappearing beneath the feet of those walking it. The suggestion is admittedly an unhappy one. Is Sistema then a fool’s errand? A road to nowhere? 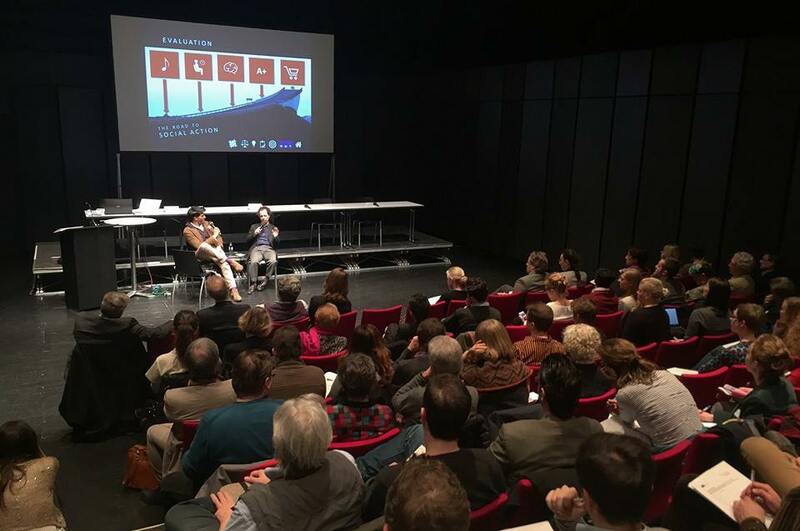 This would be a terrible place to leave an audience – and much to my chagrin, that’s precisely where I left the audience in Salzburg, since I didn’t find an opportunity to show my next slide in what was a very free and wide-ranging discussion. The image I used is that of the Storseisundet Bridge in Norway, and it is famous for the optical illusion it presents of ending in a void, thanks to a lateral curve in its arch. The bridge is complete, and it is beautiful, but by the manner of its design it deceives the first-time traveler on the path. Like the bridge itself, the metaphor makes little sense until viewed in full context. The first step in crossing the bridge is to acknowledge precisely where we are, and what steps we know we can accomplish: delivering the many existing intrinsic and extrinsic benefits of conventional music education is insufficient, because the means to do that already exist and are worth supporting for that reason only. The as-yet undocumented benefits, those that are not shared with conventional forms of music education, those that are indistinguishable from the vision that compels everyone in Sistema, are up to us to demonstrate and to deliver, but we cannot do that without a firm appreciation for what is already being accomplished. It is from there we can determine what Sistema could bring to the table that might be different. In addressing a European Sistema audience, I failed to appreciate that Sistema practitioners and leaders in Europe are as unaware of the very real, very damaging tensions that exist between Sistema and in-school music education as are their American counterparts. Unlike Canada, whose national music education association actually has a policy document towards Sistema, the US has only a latent antagonism. Working as I do in both the public schools and Sistema programs, I am acutely aware of these tensions, experiencing them almost daily. Music educators in the established sectors feel disrespected and denigrated by what one British journalist described as the “smugness” of Sistema advocates, and Sistema practitioners wonder why they aren’t openly embraced by their public school counterparts. Much of this friction is a result of the exuberant yet misguided rhetoric from a few quarters, and I openly acknowledge having broadened the rift in the past with ill-advised but snappy sound bites. Any question concerning the commitment and care of in-school music educators vs. Sistema teachers should be laid to rest by the results of Richard Hallam’s latest study,The Reflective Teacher, which reported that English music service teachers place a higher value on both the musical and social development of their charges than their In Harmony counterparts. Recognizing the value of what we already have, the value of those currently working within existing systems, is the first step to bridging some of these divides. It is also the first step to creating what we mean when we use the word Sistema, and developing what is still just an idea to its full potential as a new socially-oriented practice of music education. Hence the metaphor of the bridge, and the image of Storseisundet. What a spectacular retort! A friend and I were having a not too dissimilar discussion yesterday. The concept of the twin proposed benefits of excellence in music and positive social outcomes, where neither is less important than the other (rather than neither is more important than the other), is a complicated argument. The most irritating thing about the Venezuelan El Sistema is as Geoff Baker sums it up in his inimitable fashion, “…there are very few critical analyses of the program’s aims and no rigorous studies which demonstrate that it achieves them. Furthermore, its methods are poorly understood and obscured by idealistic rhetoric….”. But there is heaps of anecdotal evidence – such as it is. Unfortunately for advocates of El Sistema, rather than having a reference body of research spread over 40 years since the outset of El Sistema, we have a number of recent research programs all on Sistema-inspired programs in their early days (eg. Sistema Scotland – http://www.gov.scot/Publications/2011/03/16082812/0). It seems that such research holds great promise and that impoverished communities have begun to feel the effects of the social aspects of the program, but it is early days, and so much is still anecdotal. The best we can say is that it certainly has positive effects as a significant music program, and its practise and performance do with children. With everyone really – but particularly in the early developing brain – yes the more than well documented and discussed intrinsic and extrinsic benefits of music and instrumental education. But Sistema-type programs? What can we completely, accurately and truthfully claim? That if, the music is being taught by trained and competent music teachers, the process of teaching the children is perceived by them as fun, it is their choice to be there, it’s run multiple days per week and multiple hours each day, there is a rigorous and excellent standard of music education, there is good pedagogical process, the process is based on the best methods of social learning, other aspects of social well being are brought to bear, then this will probably produce good social results, and good musical ones too. But can we categorically state, that such programs produce “reduced crime and recidivism, the improved social cohesion, the diminished drop-out rate, the poverty alleviation”? Not yet, but early data suggests in Scotland at least that this is an probable effect. I think it’s a ‘common sense’ thing. If you do all of those things above and purposefully make it a dual outcome model, you will get benefits for both of them. To what extent and degree, we shall have to wait and see, but it’s likely to be good, judging from the information we do have – both research-based and anecdotally. If you spend a great deal of time working in a highly encouraging, positive and empowering environment, achieving things you couldn’t possibly imagine of yourself, then you are going to be massively better off than if not experiencing such things. Derr… as we say in Australia. I also expect that there are wide variations in potential results in Sistema-type programs given there are large numbers of programs of varying quality, and capability. Pero… eso es un otra cosa – that’s another thing entirely. I happen to think Sistema programs need to go beyond the concept of just being fancy rigorous music programs, or clever social action programs; I think we need to make the process an ongoing one, extending beyond simply the excellent music goals. I think we need to extend it into vocational support, lifestyle support, personal health, community development, social enterprise development, mentoring, coaching and guidance. Look to sport for this. This is exactly what they are trying to do with the young people in their care – to build them up a happy social and healthy human beings – in there care; and in our case, not just as musical clever kids, but developed, artistic, imaginative, capable, social, healthy and creative human beings. Those are the goals I aspire to in the programs I am developing. It’s about excellence in both fields – musical and social. I don’t believe in magic however. This is about comprehensively difficult and intensive effort, both musically and socially – and yes, bloody good research processes monitoring it all the way along. My heart grinned when Visentin ended his sentence with the word “Fly”. Let’s say the bridge is still there as its always been, as so many have relied on it and taken it without question. Most would prefer to keep their feet on the pavement and feel that was entirely appropriate. If our intention is to be agents of change is that what we want to accomplish. The problem with keeping your feet on the pavement where it is safe is that the curve descends on the other side. In regard to social and cultural change, I don’t think that was the change of direction that MLK was talking about when he stated that “the arc of history is long”. A bridge is for crossing over a barrier (whatever that may be) and coming back down to a level place. When Visentin said “Fly”, I did not see a single uniform path going upwards say like a ski lift going up a mountainside in a straight line. I saw freedom to move in any direction without being tethered to the ground. Isn’t this the best we can give all of our children? We should strive to give every one of them the best possible software available for the brain (music) and see where they take it. I always thought of education as something you give children to keep them from sticking to the spiderweb of history so that they can create their own cultures and history. Who are we to know what creative adaptions they will choose to make in the face of the future? Nature and the planet itself inevitably reminds humans that progress is not necessarily a straight line. A line can be straight depending on where you are observing it from. Most of the corporate and institutional world is busy measuring progress on flat surfaces because they are salient and much easier to market with signage. Conventional wisdom assumes that if you pour effective education into a society their mean income will go up and that these communities experience less crime. We just went through a recession that seemed to prove otherwise. Education does not always succeed in making us economically resilient. The poor or mentally and emotionally challenged are not necessarily the most violent in society. Measurement is a messy business. As you observed in your report It only gets funded and published when someone with the opportunity to make a profit has an agenda. 8.you will make some mistakes in data collection that can not be repaired after the fact. 9.some of your populations may need to disband or reorganize before you are done measuring them. 11. there will be critics. The worst ones know what they are talking about, even though they have invested nothing in any studies of their own. There are easily more detailed issues to be managed when you ask a measurement practitioner what problems they face creating instruments that collect data accurately and thoroughly. But none of this should keep us from attempting to do a measurement. What my professors did not openly discuss about measurement is that it is always a moving target and this means one is on a constant learning curb with each attempt. I can understand immediately why institutional music teacher would feel threaten by the thought of having someone do research on their programs. Most primarily they don’t trust the objectivity of the people doing the evaluations. They are already on the defensive about their value without the added insecurity of being evaluated. If you want to keep them motivated about the prospects of a measurement project you will need to allay their fears that this data will not be used to come back and haunt them by folks who like flat data charts. My suggestion would be, make your research data as multi-faceted and multi-dimensional as possible so it doesn’t lie flat on a screen. Be open to the paradoxes of the results and allow them to stand upright off the page and move in time. Look at every substudy as a window into a continuum. What good can we do if we allow some administrator or policy maker to pancake the results to anyone narrow path for their own purposes? Allow it to be as nuanced and sophisticated as technology will allow human activity to be defined.